1. Sink your weight onto right foot as you place left foot about a foot to the left with toes pointing left, and turn palms toward your body. 2. Slowly turn hips a little toward your left, and begin to shift weight onto left foot as you raise arms outward and upward to the sides in an arc until elbows are shoulder height. 3. As you put weight fully onto left foot, continue raising left arm until your elbow is about eye level and arm forms a diagonal with right leg; keep right upper arm parallel to the earth and bend right elbow so fingertips point toward the sky and palm faces forward. 4. Form an Alef by turning your head to the left and tilting it diagonally downward in line with left upper arm, face pointing toward the ground under left arm. 5. Slowly lift head upright, turn face and hips forward, and begin to shift weight to right foot as you turn palms inward toward each other and circle arms upward. 6. As you put weight fully onto right foot, turn palms toward you and cross your wrists with right hand outside left. 7. Turn palms so they face each other as if forming a bud, and lower arms in front of body with wrists staying crossed until hands are about waist height. 8. 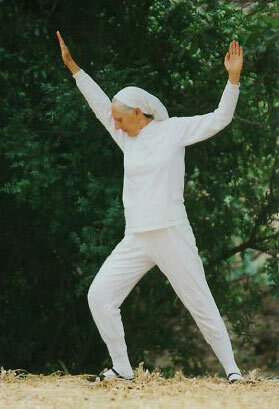 Let arms slowly separate to the sides, keeping elbows slightly bent, and repeat sequence from Step 2 eight more times, ending the last sequence by bringing left foot next to right foot and distributing your weight evenly on both feet as you lower your hands to your sides and turn palms toward the back with a circular motion until fingertips point toward the earth. 9. Repeat full sequence nine times opening toward the right side. "Alternating Alef" foot movement: Form an Alef on left side and then in Step 6, as you put weight onto right foot, turn left toe forward; then in Step 8, as arms separate to the sides, shift your weight onto left foot and turn right toes out so they point to right side and then continue movements from Step 2 to form an Alef on the right side by beginning to shift weight onto right foot. Alternate sides until you have formed 18 Alef; then close by shifting weight to right foot and bringing left foot to right foot as described in Step 8. Staying connected to the One and to the many. When weight begins to shift toward the extended leg. Yet adhering firmly to That Which Is Below. Horizontal upper arm paralleling the earth's surface. Forward and back, past and future, immanence and transcendence. And provide a unity of Being before a new cycle of Becoming begins. Caution: These movie files are very large and may take a long time to download.